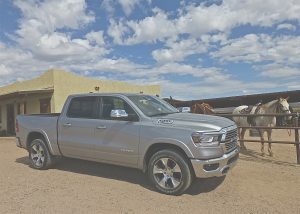 If somebody yells “Get a horse,” you can do it in style in the 2019 Ram 1500. 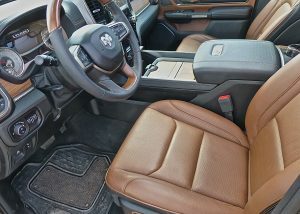 Large, roomy cab with giant nav screen and countless computer, connectivity devices highlight the Ram 1500. 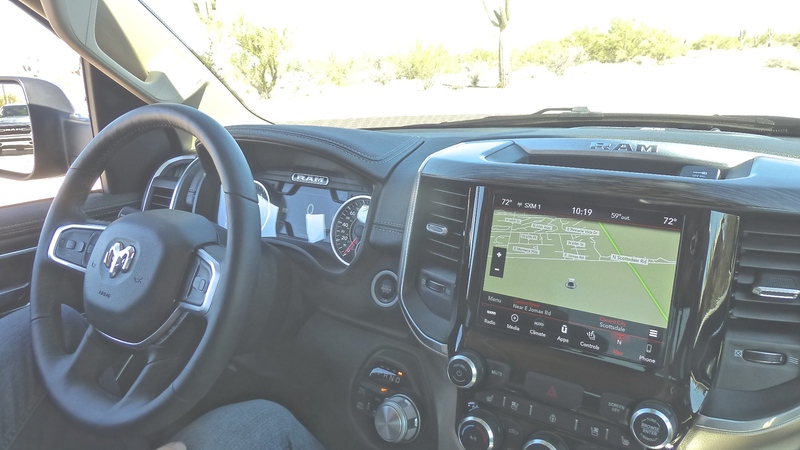 A glance at the big nav scren displays a 360-degree surround view with bird’s-eye perspective, and the 3D navigation map can be controlled by spoken destination choices. With all that quiet, incidentally, you can appreciate the huge 900-watt surround sound Harman Kardon amplifier with its 10-inch subwoofer, and noise cancellation, coordinated through 19 speakers. Doesn’t seem that long ago you’d have to use the bed to haul 19 speakers. 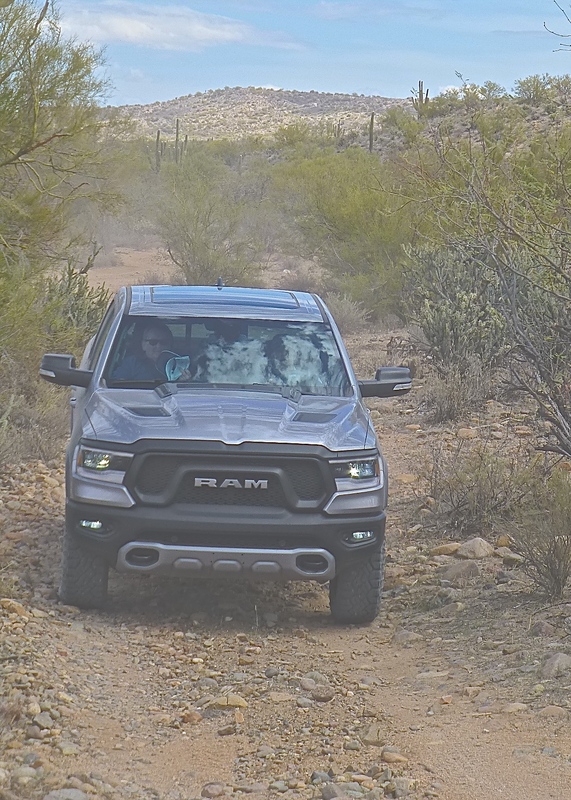 In actual driving tests, my partner and I focused more on how the Ram functioned than in all those special features. First off, we noticed how directly it went down the road, with no hint of leaning or wandering, and turning in with quick precision. We attributed all that to the stiffer frame. We also commented to each other frequently about how smoothly the Ram drove, never approaching anything that might resemble harshness. 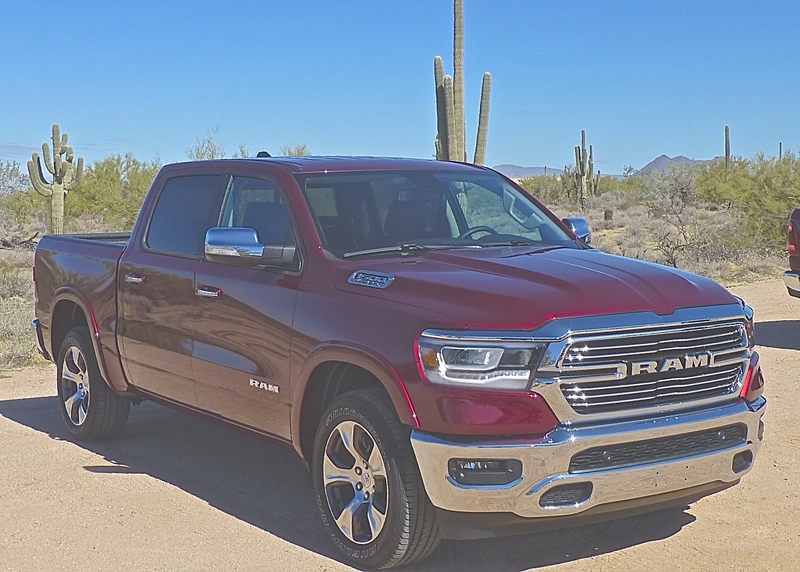 That, of course, is primarily due to the Ram being the only full-sized pickup deploying coil-spring suspension on the rear wheels. 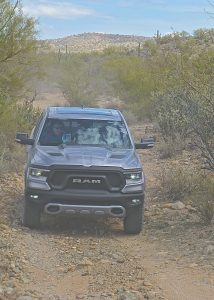 Charging through a dry wash riverbed in the Arizona desert was a smooth criuise in the Ram. That feature has been out for a few years now, and, typically, Ram engineers have refined and improved it. 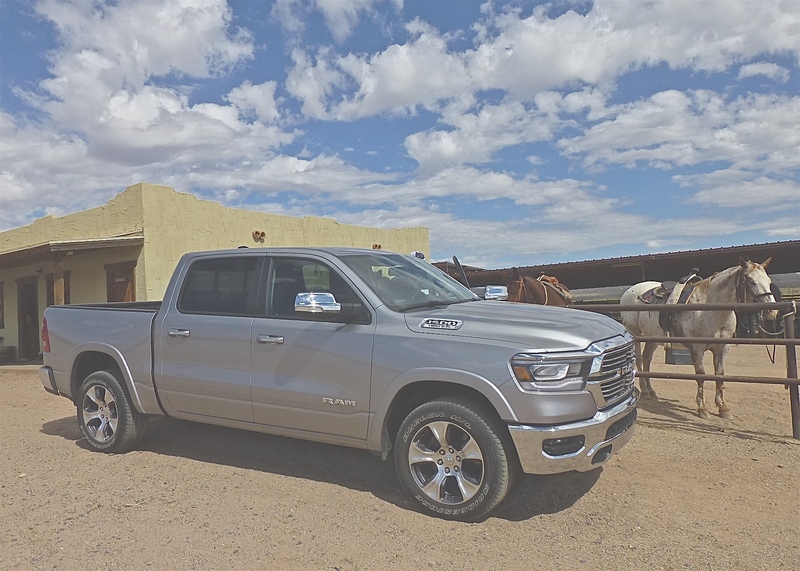 Along with on-road ride, the coil springs can be combined with air suspension to improve load leveling and fuel efficiency, while also providing some remarkable advantages in off-road driving and trailer towing. For high-tech, the FRD (Frequency Response Damping) shock absorbers are coordinated with the available air suspension for the off-road package, which provides a 1-inch lift, electronic locking rear axle, and the hill-descent control, which is useful for descending steep off-road grades, and also icy steep hills in normal winter driving. But wait, as they say, there’s more. Something called ATMM, for Active Tuned Mass Modules, combines with Active Noise Cancellation in the cabin to nullify interior noise. Those who have experienced noise-cancelling audio headphones might appreciate how a similar technique can counter vibration and lessen car noise. The 5.7-liter Hemi V8, which also improves its fuel-efficiency with cylinder deactivation, further lowers sound inside the cabin to what Ram engineers say is 66.6 decibels. 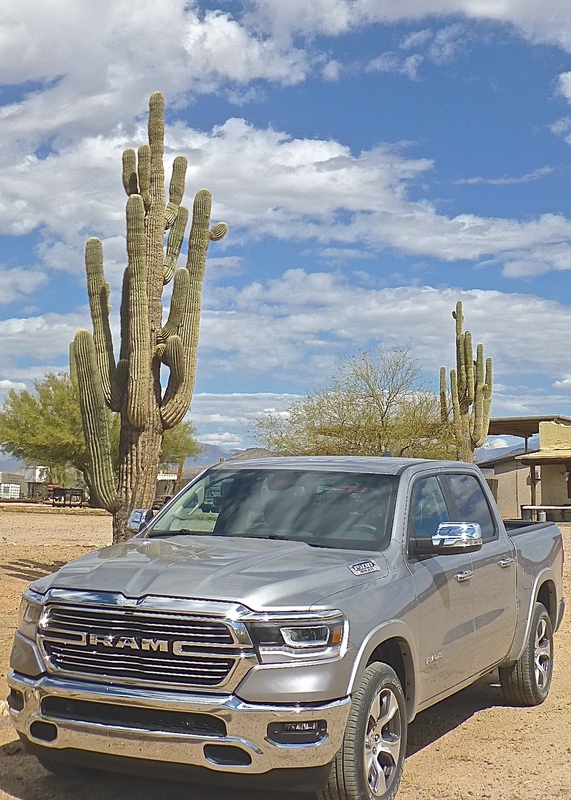 For added bragging rights, some advanced powertrain technology has a heat-exchanger to heat up a thermal rear axle gear oil system, which gives the rear axle heightened efficiency during cold starts. I may not be a truck guy through and through, but I’ve never imagined being interested in getting my rear axle oil immediately up to operating warmth. After driving out from The Boulders Resort in Scottsdale, we made our way on various Arizona highways to reach Fort McDowell Adventures, which has all sorts of off-road trails for vehicle or horseback ventures. We didn’t find the off-road challenge very challenging, but we sailed across the deep sand washes with ease, and maybe it was the interior quietness and smooth operation that made us think it wasn’t all that tough. Comfort and luxury car refinement are everywhere inside the 2019 Ram. We watched a demonstration where the driver backed up toward the waiting trailer, with its hitch poised and waiting. Shifting the air-suspension to lower the rear of the truck, then engaging the surround overhead view, the driver backed the pickup gently to locate the hitch ball under the hitch. Then he raised the air suspension, climbed out and secured the hitch. Think about it: Waiting inside, listening to satellite radio through more speakers than you can count, and merely checking on the nav screen as you back up and raise the suspension to lift the truck into the hitch. All the time free from industrial-strength Boundary Waters mosquitoes!